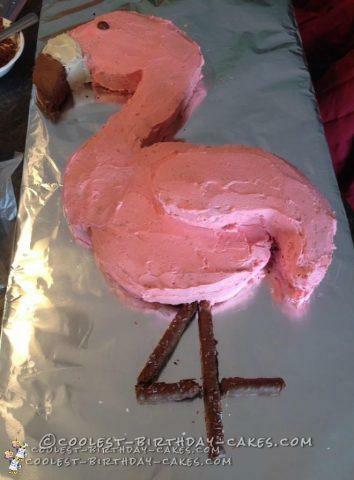 Our sweet girl turned 4 and is in love with everything flamingo, so naturally she requested a flamingo cake. When I realized that I could use chocolate covered pretzel rods to make the legs into the shape of a number 4, I knew it would be the perfect cake for her fourth birthday! Plus, I love that is ended up being so easy! I made 2 cake mixes into 4 9-inch rounds, but only needed 3 rounds. The first round was the body. The second round, I traced a small Pyrex bowl and carved a round head. Next, I cut the beak, and finally the leftover piece was the perfect shape for the raised wing. The third round, I free-handed two pieces for the neck, and used the scraps to support the wing piece that was hanging over the edge. I made a double recipe of buttercream frosting and divided into 3 parts, reserving one small part for vanilla (beak), one small part chocolate (beak), and added red food coloring to make pink frosting. The cake turned out great, and our 4 year old was absolutely oh-so-thrilled with a flamingo that she could eat! You know it’s the perfect birthday cake when the birthday girl does an imitation of the cake, posing like a flamingo!